"A beautiful destination that’s the perfect mix of culture, restaurants, shopping and sports, Abu Dhabi is not to be missed!" 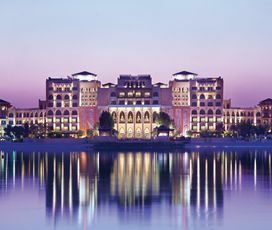 The capital of the UAE, perched on an island in the Persian Gulf, Abu Dhabi, has something for everyone to enjoy. The vast desert that surrounds it offers exhilarating fun for thrill seekers; its beaches are the perfect spot for those who wish to relax in the sun; its shops sell everything; it has history and a laid-back attitude that is perfectly complements its tearaway younger brother Dubai. 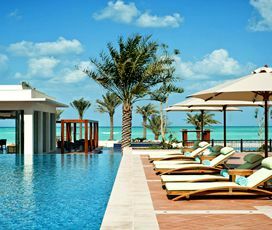 Abu Dhabi is the kind of place where adults and families can relax if they are looking for a beach or family holiday and enjoy the stunning architecture, which has put it on the map. It is sophisticated and fun: Paris to Dubai’s Amsterdam and an excellent place to holiday in the Emirates. Located on an island in the Persian Gulf, it is the capital of the UAE and generally makes most of its money from oil exports and commerce. It, like its neighbour Dubai, has used its fantastic wealth to invest in infrastructure and impressive buildings, including the huge Sheikh Zayed Grand Mosque and impressive Emirates Royal Palace. In terms of population it is medium-sized with just over one-million inhabitants. Abu Dhabi has an arid desert climate that makes it sunny and hot throughout the year. It only gets around 12 centimetres of rain per year, meaning that you won’t have to worry about getting wet during your holiday. 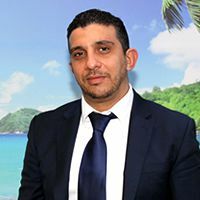 The best time to visit are in Spring and Autumn, when the temperatures are around 25 degrees and it is not outrageously hot. In the summer they can scale 42 degrees, making it difficult to explore all the wonders that the city has to offer. Originally settled by the Bedouin of the Bani Yas tribe in 1761, it quickly became an important part of the pearl trade in the late 19th century and became a protectorate of Britain in the late 19th century. This marked the zenith of its importance and it rapidly fell into decline as people became less interested in pearls. However, it struck oil in 1958 and has since become one of the richest cities in the world. No trip there would be complete without some time spent on their golden sands, which can be easily accessed from the Corniche. Ferrari World is also an excellent choice for thrill loving kids, with a museum devoted to the cars and the world’s fastest roller coaster. The Al Ain Zoo has a plethora of animals, which all nature lovers are sure to enjoy, and the various malls have plenty of attractions to keep younger visitors busy, like ice-rinks and cinemas. 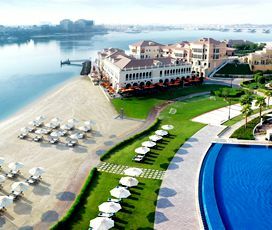 If you’re looking to explore Abu Dhabi’s attractions, make sure you take a tour of some of the city’s most interesting islands including Delma Island, Reem Island, Nurai Island and Yas Island. Not only can you enjoy Abu Dhabi’s many private and public beaches but the coastal location also means that you can enjoy fishing tours or luxury cruises. There are also a number of UNESCO World Heritage Sites not to be missed such as Al Ain Garden City.The spectacular architecture of the city is something that all visitors should pause to appreciate with the luxury Emirates Palace and the large Sheikh Zayed Grand Mosque both excellent examples. 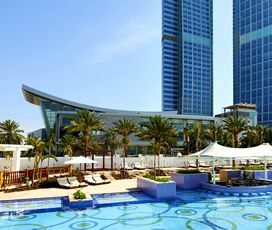 Visitors should also take a trip to the top of one of the many skyscrapers and enjoy the panoramic view with Etihad Towers and its ‘300 Observation Deck’ probably the best. Adventure seekers should head to the thrilling desert area outside of the city, where you can dune-buggy, ride a hot air balloon or go for a traditional camel ride. While the area around Jebel Hafeet plays host to one of the best roads in the world. 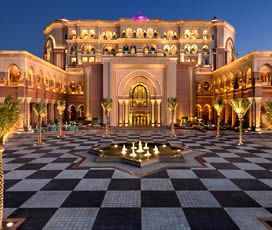 Abu Dhabi doesn’t quite exude the glamorous party lifestyle of Dubai, but it does offer a number of chic bars and nightclubs for those who like to indulge in after-hours drinking and dancing. 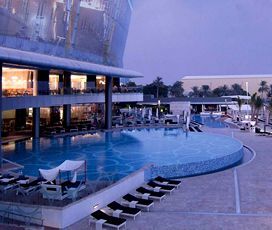 Generally, the nightlife vibe in Abu Dhabi is much more relaxed and laid-back than that of Dubai; but that doesn’t mean that it’s lacking in style and choice. If you love to grab a few drinks after dinner but prefer a slightly more serene pace of partying, Abu Dhabi is the place to be. The city’s ‘Ladies Nights’ offer half price drinking for women and you’ll find the expat community hanging out at the city’s many hotel bars and shisha bars. Some top bars and nightclubs include Jazz Bat, O1NE Bar, Level Lounge, Abu Dhabi Sports Bar and Eight Nightclub. It is the absolute shopper’s paradise, with a multitude of excellent malls selling international and local goods. The largest mall is the Marina Mall, which plays host to more than 400 stores offering brands from around the world. However, the Yas Mall and the Abu Dhabi Mall are also excellent. This combined with the more traditional souks that offer jewellery and handcrafted goods, ensures that there is something for everyone to enjoy.